Rapid protein use is desirable immediately before and after exercise to help refuel recovering muscles, but delayed digestion and absorption may be more beneficial at other times-including bedtime when your body typically goes for hours without food. ON Casein proteins are acid sensitive and tend to thicken in the stomach. Because of this, it can take more than twice as long for our Gold Standard 100% ON Casein to be broken down into its amino acid subcomponents than other proteins. By blending premium micellar and calcium caseins, we've created a protein formula that's truly time-released. - Essential Amino Acids (EAAs): Tryptophan 292, Valine 1609, Threonine 1039, Isoleucine 1312, Leucine 2129, Lysine 1822, Phenylalanine 1144, Methionine 644. - Conditionally Essential Amino Acids (CAAs): Arginine 866, Cystine 79, Tyrosine 846, Histidine 688, Proline 2421, Glutamine & Precursors 4950. - Nonessential Amino Acids (NAAs): Aspartic Acid 1589, Serine 1396, Glycine 510, Alanine 664. Right before or after training, rapidly digesting whey protein helps start recovery, a process that can take up to 48 hours. ON Casein is Perfect Between meals and before bed, when nutritional support won’t be available for a while, casein protein can help provide longer lasting amino acid support. ON Casein proteins are pH sensitive and gel in the acidic environment of the stomach. As a result, it can take longer for caseins to be broken-down into their amino acid subcomponents than whey and other proteins. Because of their unique slow-digesting qualities, caseins are described as anti-catabolic or muscle-protecting proteins. Faster digesting protein is desirable immediately before and after exercise to help refuel recovering muscles, but slow digestion and absorption may be more beneficial at other times - including bedtime when your body typically goes for hours without food. 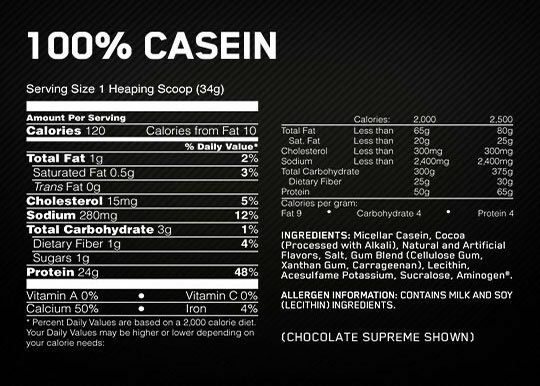 Optimum Casein proteins are acid sensitive and thicken in the stomach. 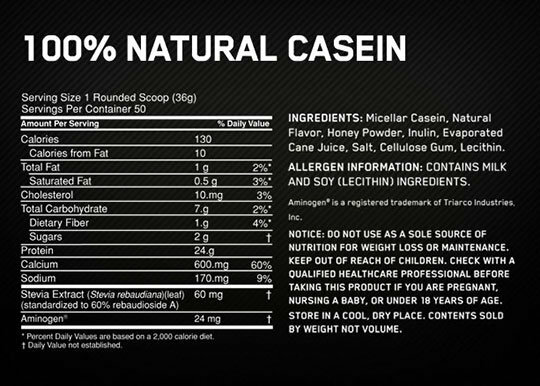 Compared to some other proteins, it can take longer for our Naturally Flavored ON Casein to be broken down into its amino acid subcomponents. By using only premium micellar casein as a protein source, we’ve created a formula that sets the standard for slow digesting protein support. SHAKER CUP: Using a shaker cup is the easiest and most convenient way to mix up a consistently great casein shake every time. Just add one heaping scoop of ON Casein to your shaker cup and then pour in 10-12 oz of your preferred beverage. Cover and shake for 25-30 seconds. BLENDER: Add one heaping scoop of of ON Casein to a blender filled with 10-12 oz of water, milk, or your favorite beverage. Blend for 20-30 seconds. Then add 3-4 ice cubes and blend for an additional 30 seconds. SPOON STIRRED: If you forgot your shaker cup or don't have time to get out the blender, you can just add one heaping scoop of of ON Casein to a glass filled with 10-12 oz of cold water, milk, or you favorite beverage. Then mix it up with a spoon for about 30 seconds or until powder is dissolved. Muito bom. Chegou rápido como sempre. Very good. Arrived as fast as ever. 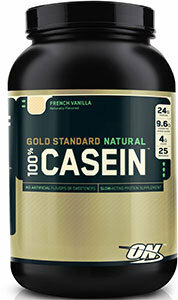 We have a large selection of in-stock OPTIMUM NUTRITION products including Natural Casein Protein items and others for the lowest prices at SameDaySupplements.com® It's always easy to shop for Casein Protein By Optimum Nutrition at SameDaySupplements.com® because you can browse by reviews, brand, prices or search for specific ingredients using our search tool. In-stock orders placed before 3pm EST ship out the same day to USA, Brazil, United Kingdom, Canada, Germany, Australia, Japan, India, France and worldwide at the cheapest prices online.